Nothing like a 1,000-hp Camaro let loose on a Texas track. Many . Only 3,000 out of the 3,300 built were sold in the US after all. But for those seeking nothing but horsepower, Hennessey Performance has an easy alternative for around $55,000 ( the cost of the car itself): the 1,000 hp and 966 lb-ft of torque Camaro ZL1, . 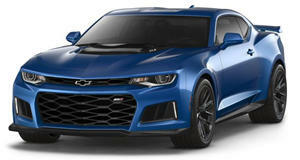 The Camaro ZL1 already comes stock with an impressive 650 hp, but it’s still not Demon beating. Some of the many upgrades Hennessey has done include a larger supercharger with 14 psi of boost pressure, new camshafts, ported factory cylinder heads, long-tube stainless steel headers, and a custom engine management system. The combined work allows for a 0-60 mph in less than three seconds. The quarter-mile sprint will happen in less than 10 seconds. However, Hennessey is limiting production to 1,000 units per year, but something tells us not all of them have been spoken for just yet. Why’s that? This new Hennessey video showcasing The Exorcist Camaro ZL1 LE in action on the track. Sometimes it takes an Exorcist to root out a Demon or two.